It’s been a busy week, and the amount of housework, yardwork and outings meant that I didn’t have as much time available for cooking, so I mostly stuck with the tried and true. I did manage to bake some muffins and sourdough bread, made a batch of sauerkraut and did a bunch of sun- and oven-drying, but those deserve their own posts. Last night we had a hankering for chocolate chip cookies but were out of eggs. Now that I’m making regular batches of breakfast muffins to replace our former habit of buying them from Costco, we’re going through eggs and flour in the blink of an eye. This is one of the big reasons I love making cinnamon flops—they don’t use eggs, unlike the majority of my breakfast recipes—and I’ve been keeping an eye out for other eggless, or even vegan, baking recipes to use in a similar pinch (that all-in-the-pan chewy chocolate cake is another eggless favorite in our house). 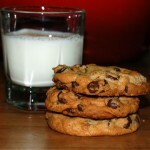 Lucky for us, I had made note of a chocolate chip cookie that replaced the eggs with yogurt, and since I am forever trying to come up with good uses for my homemade yogurt, it was a natural choice. The cookie dough was a little more pale and sticky than our favorite recipe, but it tasted right; and as it contains no eggs, I was perfectly happy to share some smudges of it with Nolan as I dished it onto the baking sheet. As with most cookies, I used my 2-tablespoon disher for the job, so the cookies needed a full 10 minutes to bake. The finished cookies were just golden around the edges and very pale on top; they puffed vertically much more than they spread out, and since we aren’t big cake-cookie fans, I flattened their tops with a spatula before transferring to the cooling rack. 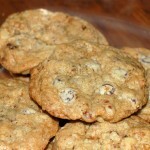 They were very gooey while hot from the oven, and cooled into a similar texture to store-bought “soft-baked” cookies. 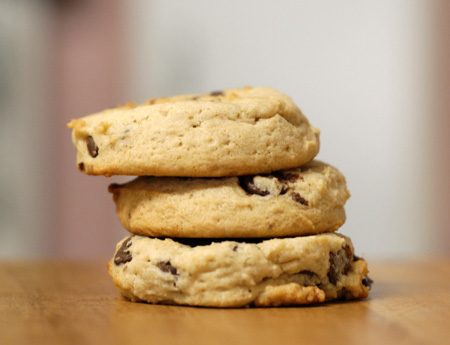 Although we still prefer our gold standard chocolate chip cookie recipe, this one came in second place for me out of all the chocolate chip cookie recipes we’ve tried over the years, without even taking into account the handiness of substituting yogurt for the eggs. Definitely a keeper! I’m not great at planning ahead, so I often don’t think to soften my butter on the counter ahead of time. Through trial and error, I’ve found that I can soften up a stick of butter in my microwave—without totally melting it—by setting it at 30% power for 30 seconds. For this recipe I used organic sugar, Spectrum shortening, white whole wheat flour, and drained homemade yogurt. In a medium bowl, cream together the brown sugar, white sugar, butter and shortening until light and fluffy. Stir in yogurt and vanilla. 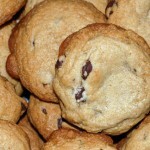 Combine the flour, baking soda, and salt; stir into the creamed mixture until incorporated, then mix in chocolate chips. Drop by rounded teaspoonfuls 2 inches apart onto the prepared cookie sheets. 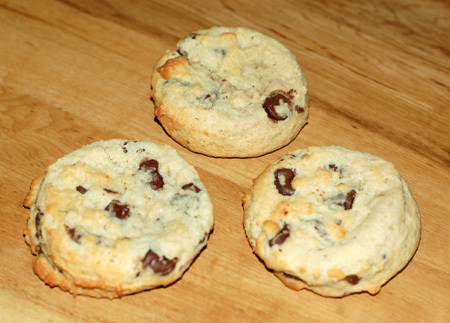 Bake for 8 to 10 minutes in the preheated oven, until the edges begin to brown. Tap the tops with the spatula to flatten, if desired, then remove to wire racks to cool completely. Source: Slightly adapted from Allrecipes. This looks wonderful. Im saving this recipe to try soon.If you won’t mind I’d love to guide Foodista readers to this post.Just add the foodista widget to the end of this post and it’s all set, Thanks!